This site is made and served on an aging and increasingly cranky  or quirky, depending on its mood  G4 Macintosh, which replaced my 7100 a couple of years ago. (The old Penelope, you will be glad to know, sits at home running the lights in my house and serving as a word processor when I have time to work from home.). Texts are input and HTML-ized using BBEdit, software whose usefulness and usability it would be difficult to overstate. Buy it if you run Mac OS. If you don't run Mac, buy a Mac and then buy BBEdit. It will be one of the few purchases of your lifetime that you will never regret. The originals of the texts reside, for the most part, in the University of Chicago libraries. There is, by the way, no pattern to the selection of the "Other Texts", other than that I like them and that they are seldom to be found elsewhere, either on the web or in most libraries. I occasionally get a letter from somebody seeking some connection; often, this is from somebody frantically trying to do a last-minute research paper from the web. This is not recommended. By the way, notes that are by me should not be lifted without credit, especially those notes that emend the text (and there are several, some of which took some amount of labor on my part). 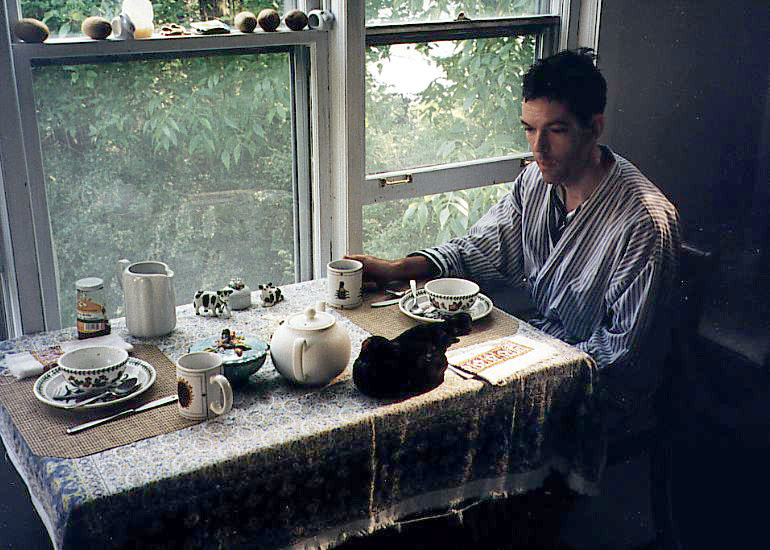 That's me below, the great big slowly loading picture, at breakfast with a chicken. You may also gaze upon my cat, Boo, or some other pictures if you are in need of something to pass the time.